The mobile device management (MDM) authority setting determines how you manage your devices. As an IT admin, you must set an MDM authority before users can enroll devices for management. Intune Standalone - cloud-only management, which you configure by using the Azure portal. Includes the full set of capabilities that Intune offers. Set the MDM authority in the Intune console. Intune co-management - integration of the Intune cloud solution with System Center Configuration Manager for Windows 10 devices. You configure Intune by using the Configuration Manager console. Configure auto-enrollment of devices in Intune. Mobile Device Management for Office 365 - integration of Office 365 with the Intune cloud solution. You configure Intune from your Microsoft 365 admin center. Includes a subset of the capabilities that are available with Intune Standalone. Set the MDM authority in Microsoft 365 admin center. In Configuration Manager version 1610 or later and Microsoft Intune version 1705, you change the MDM authority without having to contact Microsoft Support, and without having to unenroll and reenroll your existing managed devices. For details, see Prepare to change the MDM authority to Configuration Manager. If you haven't yet set the MDM authority, follow the steps below. To change from one MDM authority to another, see the change MDM authority section below. Select the orange banner to open the Mobile Device Management Authority setting. The orange banner is only displayed if you haven't yet set the MDM authority. A message indicates that you have successfully set your MDM authority to Intune. When Android or Apple device management is enabled, Intune sends device and user information to integrate with these third-party services to manage their respective devices. You enable Android work profiles. You enable and upload Apple MDM push certificates. You Enable any of the Apple services, such as Device Enrollment Program, School Manager, or Volume Purchasing Program. After you switch to the new MDM authority, there will likely be transition time (up to eight hours) before the device checks in and synchronizes with the service. You're required to configure settings in the new MDM authority (hybrid) to make sure that enrolled devices will continue to be managed and protected after the change. Devices must connect with the service after the change so that the settings from the new MDM authority (Intune standalone) replace the existing settings on the device. After you change the MDM authority, some of the basic settings (such as profiles) from the previous MDM authority (Intune standalone) will remain on the device for up to seven days or until the device connects to the service for the first time. It's recommended that you configure apps and settings (policies, profiles, apps, etc.) in the new MDM authority (hybrid) as soon as possible and deploy the setting to the user groups that contains users who have existing enrolled devices. As soon as a device connects to the service after the change in MDM authority, it will receive the new settings from the new MDM authority and prevent gaps in management and protection. 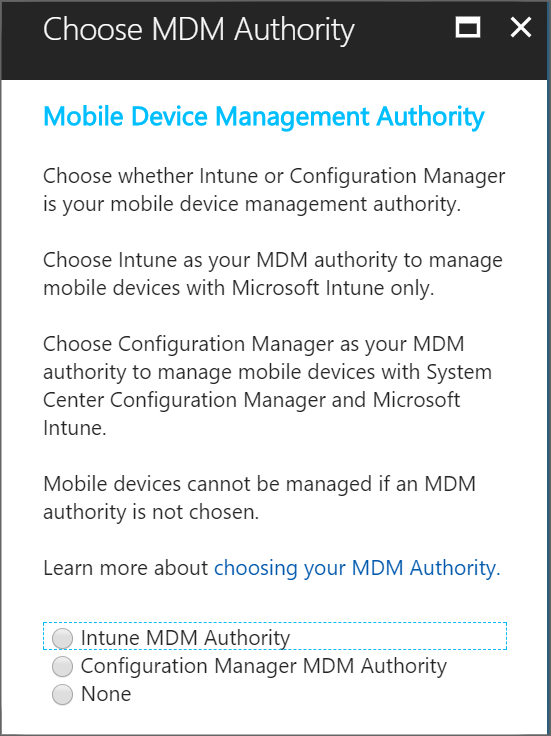 When the same device categories exist in both Intune and Configuration Manager, any device category assignments for devices are not carried over after you switch to the new MDM authority. To continue using device categories, migrated devices have to be manually added to the appropriate collections after the MDM authority is changed and the devices display in the Configuration Manager console. Devices that don't have associated users (typically when you have iOS Device Enrollment Program or bulk enrollment scenarios) are not migrated to the new MDM authority. For those devices, you need to call support for assistance to move them to the new MDM authority. You must have Configuration Manager version 1610 or higher for the option to change the MDM authority to be available. It can take up to eight hours for a device to connect to the service after you change to the new MDM authority. Create a Configuration Manager user collection with all users currently managed by Intune standalone that you will use when you set up the Intune subscription in the Configuration Manager console. This collection helps to ensure that the user and their devices will have a Configuration Manager license assigned and be managed in the hybrid environment after the change to the MDM authority. Make sure that the IT Admin user is in this user collection too. Before the change, the MDM Authority will show as Set to Microsoft Intune (standalone) in the Intune administration console. The MDM authority should display Set to Microsoft Intune (standalone tenant) in the Microsoft Intune administration console prior to the change in MDM authority. If your MDM authority displays Managed by Intune and Office 365, then your Office 365 managed MDM devices are no longer be managed when you change your MDM authority to Configuration Manager (hybrid). We recommend that you license those users for Intune or Enterprise Mobility Suite before you change the MDM authority. In the Microsoft Intune administration console, remove the Device Enrollment Manager role. For details, see Delete a device enrollment manager from Intune. Turn off any device group mappings that are configured. For details, see Categorize devices with device group mapping in Microsoft Intune. There should be no noticeable impact to end users during the change in MDM authority. However, you might want to communicate this change to users to make sure that their devices are powered on and that they connect with the service soon after the change. This precaution makes sure that as many devices as possible connect and register with the service through the new authority as soon as possible. If you're using Intune standalone to manage iOS devices prior to the change in MDM authority, you must make sure that the same Apple Push Notification service (APNs) certificate that was previously used in Intune is renewed and used to set up the tenant again in Configuration Manager (hybrid). If a different APNs certificate is used for hybrid, then ALL previously enrolled iOS devices become unenrolled and you have to go through the process to reenroll them. Prior to making the MDM authority change, make sure that you know exactly what APNs certificate was used to manage iOS devices in Intune. Find the same certificate listed in Apple Push Certificates Portal (https://identity.apple.com) and make sure the user whose Apple ID was used to create the original APNs certificate is identified and available to renew the same APNs certificate as part of the change to the new MDM authority. In the Configuration Manager console, go to Administration > Overview > Cloud Services > Microsoft Intune Subscription, and select to add an Intune subscription. Sign in to the Intune tenant that you originally used when you set the MDM authority in Intune, and click Next. Select Change my MDM Authority to Configuration Manager, and click Next. Select the user collection to contain all of the users that continue to be managed by the new hybrid MDM authority. Click Next and complete the wizard. The MDM authority is now changed to Configuration Manager. Sign in to the Microsoft Intune administration console using the same Intune tenant and confirm that the MDM authority has been changed to Set to Configuration Manager. After changing the MDM authority to Configuration manager, you can set up iOS enrollment and Android enrollment. In the Configuration Manager console, configure and deploy new settings and apps from the new MDM authority (hybrid). The next time devices connect to the service, it synchronizes and receives the new settings from the new MDM authority. To activate Office 365 MDM in addition to your existing Intune Service, go to https://protection.office.com, choose Data Loss Prevention > Device Security Policies > View list of Managed Devices > Let's get started. For more information, see Set up Mobile Device Management (MDM) in Office 365. If you want the end users to only be managed by Office 365 MDM, then remove any assigned Intune and/or EMS licenses after activating Office 365 MDM. The MDM certificate is renewed automatically when mobile devices are communicating with the Intune service. If mobile devices are wiped, or they fail to communicate with the Intune service for some period of time, the MDM certificate will not get renewed. The device is removed from the Azure portal 180 days after the MDM certificate expires. The MDM authority can't be changed back to Unknown. The MDM authority is used by Microsoft servers to determine which portal that enrolled devices report to (ConfigMGR, Azure Intune, Office 365 MDM). When the Intune service detects that a tenant’s MDM authority has changed, it sends out a notification message to all the enrolled devices to check in and synchronize with the service (this notification is outside of the regularly scheduled check-in). Therefore, after the MDM authority for the tenant has been changed from Intune standalone to hybrid, all the devices that are powered on and online will connect with the service, receive the new MDM authority, and be managed by hybrid. There is no interruption to the management and protection of these devices. Even for devices that are powered on and online during (or shortly after) the change in MDM authority, there will be a delay of up to eight hours (depending on the timing of the next scheduled regular check-in) before devices are registered with the service under the new MDM authority. Between the time when you change the MDM authority and when the renewed APNs certificate is uploaded to the new authority, new device enrollments and device check-in for iOS devices fail. Therefore, it's important that you review and upload the APNs certificate to the new authority as soon as possible after the change in MDM authority. Users can quickly change to the new MDM authority by manually starting a check-in from the device to the service. Users can easily make this change by using the Company Portal app and initiating a device compliance check. To validate that things are working correctly after devices have checked-in and synchronized with the service after the change in MDM authority, look for the devices the Configuration Manager console. The devices that were previously managed by Intune are now displayed as managed devices in the Configuration Manager console. After you change to the new MDM authority, the compliance data in the Microsoft Intune administration console can take up to a week to accurately report. However, the compliance states in Azure Active Directory and on the device will be accurate so the device is still be protected. Make sure the new settings that are intended to overwrite existing settings have the same name as the previous ones to ensure that the old settings are overwritten. Otherwise, the devices might end up with redundant profiles and policies. As a best practice, you should create all management settings and configurations, as well as deployments, shortly after the change to the MDM authority has completed. This helps ensure that devices are protected and actively managed during the interim period. Make sure the newly enrolled device shows up in the Configuration Manager console. Perform an action, such as Remote Lock, from the administration console to the device. If it's successful, the device is being managed by the new MDM authority. If you have issues with specific devices, you can unenroll and reenroll the devices to get them connected to the new authority and managed as quickly as possible. With the MDM authority set, you can start enrolling devices.